After uploading the files log in to Exam. 3. Define the basic information. Give a descriptive name to your exam e.g. 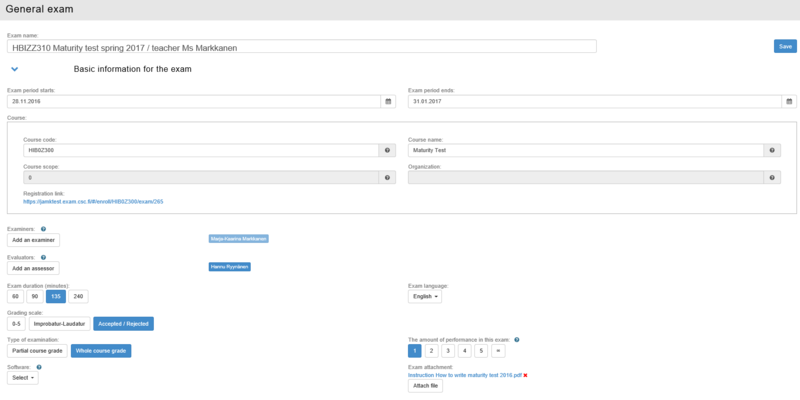 ”HBIZZ310 Maturity test spring 2017 / teacher Ms Markkanen”. Define the exam period, during which the exam can be taken. Select the duration 135 minutes for the exam. Note that the last five minutes of the exam duration is reserved for returning the exam and exiting the computer. Mention this to the student. Set the grading scale, the language and other information. 4. Draw up the instructions visible during the exam. You may utilize the texts in Elmo-intra > Maturity test in Exam. 6. 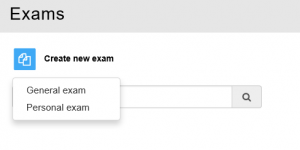 After publishing, the exam is visible to the students and they can sign up now for an Examstudio exam. Notice, that the Exam assessment data is not automatically synchronised to ASIO or Optima. Contact the student services.